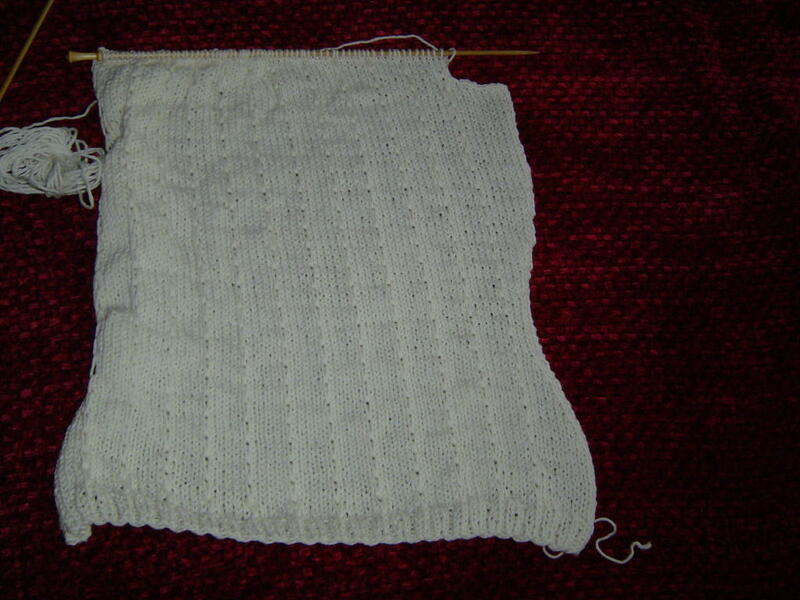 I'm just past the armhole shaping on the White Tank, which shall hereby be known as ...(drumroll please)...Snow Cone. Both Mindy and Robbyn suggested Snow something names and for a summer tank, I couldn't do a snowy name, but the idea of a summer treat, that drips all over the place as a name for a white tank just works. So, Snow Cone it is. I'm trying out different backgrounds in hopes that something will show up better. Today, we have a red chenille throw. It works a little better, but I think I'll keep looking. Just a side note, I'm starting to think I might not have enough yarn for this. This is recycled yarn from a tank from last summer that I didn't like and I actually made this one smaller, hoping it would fit better, but the first tank had a lace panel up the front and this one doesn't. I think the slipped stitches probably use less yarn than I would use if it was Stockinette, but I'm starting to freak out. Oh well, I'll figure it out later. We got the final clue in the Mystery Shawl this morning, so I hope to finish that this weekend. I'm thinking about adding beads to the edge of the shawl so I'll have to figure out if I want to do this or not. Hope you all have a great weekend. I've got some knitting to do.